and are NOT accepting new rentals. Hold your event in a very special place! 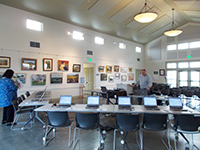 Great Blue Heron Hall at the Laguna Environmental Center is the perfect setting for your next meeting, symposium, professional gathering, retreat, workshop, seminar, in-service training, conference, lecture, book signing, or documentary film event. only educationally-oriented events. Please see our FAQs. A Great Place for Your Meeting or Educational Event! • See our full EQUIPMENT LIST that is available with rentals. • Click here for useful, detailed DIRECTIONS to the Laguna Environmental Center. • Larger capacities are possible when weather allows for utilizing the additional outdoor spaces. The Laguna Environmental Center is a wildlife preserve on historic Stone Farm, a working farm; please leave pets at home (official service animals are welcome). The Environmental Center, including Heron Hall, is a smoke-free venue. The regular rental fee is $150/hour with a 4 hour minimum. We offer a discounted rental fee of $120/hour with a 4 hour minimum for non-profit organizations. Please review our one-page FAQs before calling or submitting the Rental Reservation Request form. Once you've read through the FAQ above, please complete the Rental Reservation Request form. After this form is received and reviewed by the Laguna Foundation, a Rental Agreement will be issued including the total rental cost, deposit amount, payment due dates, and rental details. See our Rental Agreement SAMPLE for details about what's included and what our requirements are for rentals. Thank you very much for considering Great Blue Heron Hall for your event! Your rental fees directly support the non-profit organization, the Laguna de Santa Rosa Foundation, helping us further our mission to restore and conserve the Laguna de Santa Rosa and to inspire public appreciation for this Wetland of International Importance. For more information, please email HeronHall@LagunaFoundation.org.